"From the first time I met Leon, I have been impressed with his consistently professional manner while at the same time being friendly and caring to his customers and staff." "Your service is always prompt and your staff very helpful." "Shawn Shelly quickly assessed our problem and then he used his well stocked van to remedy same. He was polite, expeditious and accurate in his assessment. What more could you ask of a service call. Mr. Shelly will be a hard act to follow." "I am very pleased with Ron and the cost of the repairs. 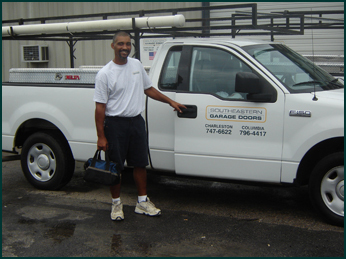 I will recommend Southeastern Garage Doors to everyone." "Thank you. Brian did a GREAT job!" "I’m very impressed with your service and your serviceman, Shawn. You came the same morning I called, at the time you said you would come, and did the job quickly and well. I’ll tell others about you." "I am a real estate agent and had a house scheduled to close. The day prior, we found that one of the garage doors was no longer working. I called your office Monday morning and they were able to get someone out there that same day before the closing. Shawn came out and actually called to let me know he could be there earlier if I could meet him. He quickly determined the problem. A part had to be ordered but Shawn went to the trouble to double check that this was indeed the only problem by swapping it out with the other opener so we could all be sure. This service allowed the buyers to feel comfortable enough to go forward with the closing, which happened on time. Your office staff was wonderful too. Everyone I dealt with was helpful, courteous and a pleasure to deal with. Brenda called to let me know when the new part was installed after closing for the new buyer, just so both my sellers and myself could be sure that the problem was taken care of completely. It is seldom that you see such great service these days." We have found that the best advertising is word of mouth, and we'd love to hear what you have to say about your experience with our company. Please take a moment to share your thoughts. We sincerely appreciate your time and efforts! Click your preferred site to leave a review or comment. If you already have a Gmail, Yelp or Yahoo Mail account, choose one of those. You may use your Facebook login at Citysearch & Insider Pages. Otherwise a quick registration at Citysearch, Merchant Circle or Insider Pages might be easiest.